Woohoo it’s finally Friday!!! It’s going to be so nice to have a long weekend!!! No major plans, just some computer work for me!! Today is the Holiday Recipe Club Blog Hop sponsored by Erin from the Big Fat Baker. Today’s hop is to celebrate Memorial Day. We had our choices to use Watermelon, Pork or Beer. I was excited when Erin sent me an e-mail saying yup, were having a Holiday Blog Hop!! That means I get to share with you this yummy creation! This my Friends is a Watermelon Strawberry Float! It is so yummy!! Full of fresh fruit and a little fizz to tickle your tummy! I got the idea for this recipe from my Health Magazine. I changed it up a little bit from the original recipe. I decided to use real vanilla ice cream instead of lime or lemon sorbet. To me a float is with ice cream not sorbet. Also, to be honest with you, the sorbet had way more sugar than real ice cream. When I was on my freezer isle journey I decided to do some research on the nutritional value of ice cream treats. This is what I came up with. So I decided on the ice cream. So glad I did, man is it good! Anyway, the sugar was less in the ice cream than the sorbet and so were the carbs. For Dreyers, I don’t like splenda, it’s not real and leaves me with a stomach ache, so I decided that Bayview, which was real, and yes it has more fat, but I personally do not consume to much fat so as a TREAT I decided I could use a little more fat. I’d rather have something natural than something fake. Besides I am not sure what sugar alcohol is, but I know it’s still sugar, so Dreyers to me has 7 grams of sugar. That is my opinion, what would you personally prefer? I’m curious to how you feel. By the way, this was the first time I had real ice cream in over two years and it tasted so creamy and delicious. I forgot what real tastes like. Oh please know, I am not telling you to run out and buy ice cream, because it isn’t the healthiest treat out there. Personally this will probably be the only gallon I buy for myself this year. This is a once in a while treat. 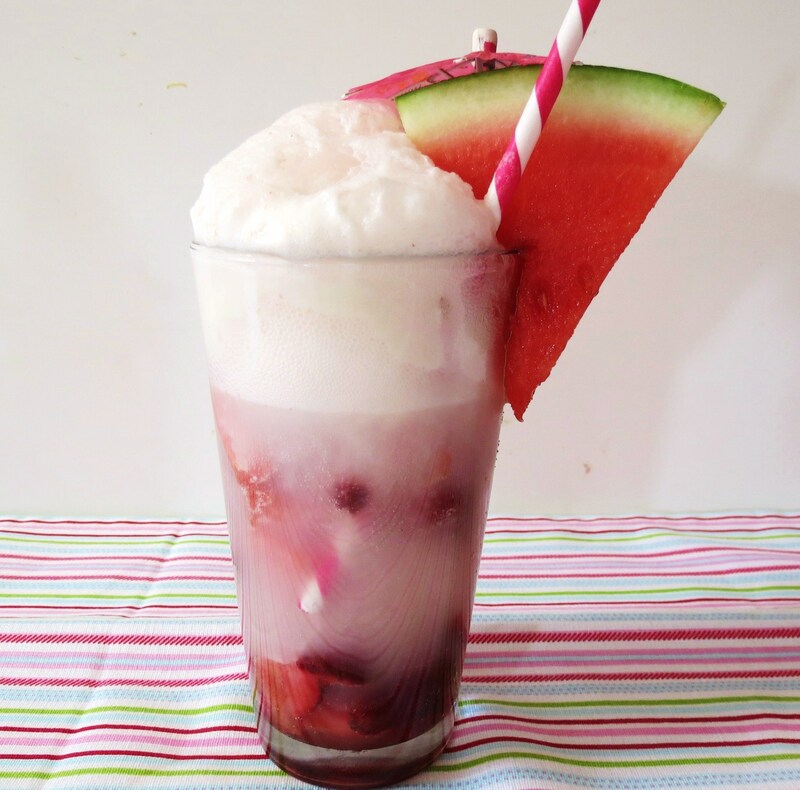 Ok, enough about calories and ice cream, let me get back to my fabulous float! This recipe is made with watermelon, strawberries, balsamic vinegar, cayenne pepper, lime juice, ice cream and setzler water. It tastes amazing! A weird combination, but it works. I haven’t had a float in years! I love the fizzy top it gets. If you don’t have setzler water, lime soda would work to, just omit the lime juice. Since the original recipe called for lime sorbet, I decided to add some lime to the drink to give it more of a soda taste. I personally do not like the taste of plain setzler water. It’s weird tasting to me. Blah! Don’t you think the little umbrella is cute? I picked up a pack at Cost Plus. I just love that store. I really need to go soon. I hear there having a Memorial Day Sale. he he! This weekend, right now I just decided I need a treat! I’m going to go shopping. I am in real need of some summer clothes. I haven’t bought myself any new clothing since Black Friday. If you know me, thats a heck of a long time. Besides summer clothes are so pretty!! 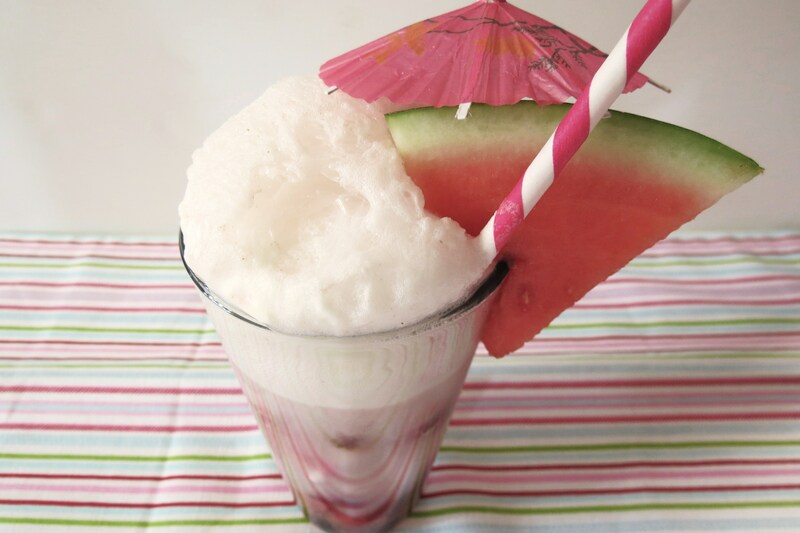 A summer time ice cream float made with fresh watermelon, sweet strawberries and creamy vanilla ice cream. Evenly divide watermelon mixture between 2 glasses. Add ¼ tsp lime juice and ¼ cup ice cream to each glass. Add club soda or seltzer water to fill the glass. 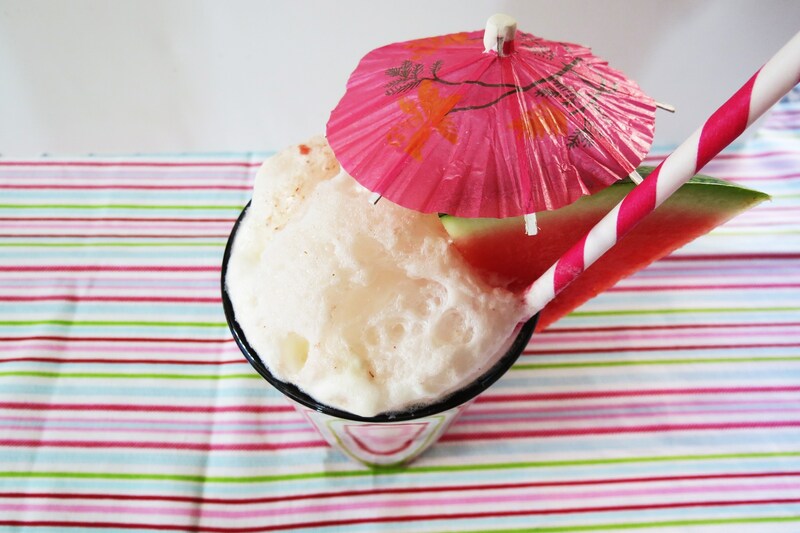 Garnish with a slice of watermelon, straw and umbrella. Well Guys I should go! My kitchen looks like a hurricane struck it!! Eck!!!! But before I go, if your interested in joining the Holiday Recipe Club you can go here to get all the details. Thank you Erin for hosting another wonderful event!! And you out there, join the club! It’s so much fun!! Have a great day everyone and just think it’s Friday!! I hope you have a great weekend!!! P.S. Be sure to check out everyone’s recipes below! I can’t wait to see what everyone is going to post. I love all the ingredients in this hop!! Your funny Girlfriend! Tell Chris I love the salsa!! I like the comparisons you do! All I can say us Yummy!!! And I do like the comparisons so keep popping those out of your head! Oh and sugar alcohol I’m not sure what it is either but it totally gives me a stomach ache!! Have a great Holiday weekend and buy yourself some summer clothes!! Yup, sugar alcohol gives me a stomach ache too! You have a great weekend too!!! Sounds like a great combination of ingredients! I will bookmark this to make when my next summer comes around and I will definitely try this!! Thanks for sharing. You are right about checking things which are supposedly healthy, usually things that are “low fat” have loads of added sugar to make up for the fact that a lot of the taste gets removed with the fat. I agree that it is better to have a small higher fat treat every once in a while then to eat processed “low fat” treats often. Your next summer? Where do you live? Funny how some things you think are healthy than you read the ingredients and there not! Near Sydney, starting to get mighty cold where I live! I am SO intrigued by the cayenne and vinegar in this recipe! YUM! You don’t really taste the Cayenne and Vinegar in it, but it’s a tasty drink! I love strawberries too, there my favorite fruit!!! 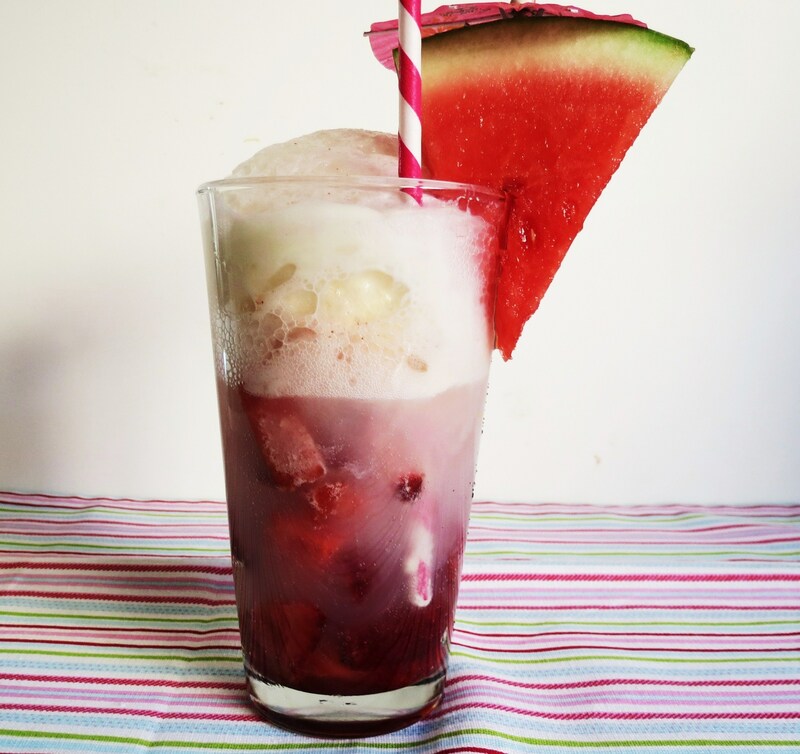 Would’ve never thought to put watermelon and a float together but I am totally on board. Looks awesome. Thanks Erin!! I love strawberry and watermelon together, as you can tell. I like the way you think in regards to processed vs fat (Hungry Girl drives me crazy for this very reason). This looks amazing! Hungry Girl has a lot of great recipes, but I am not big on all the processed foods she uses. I make her stuff, but change it up for real stuff. 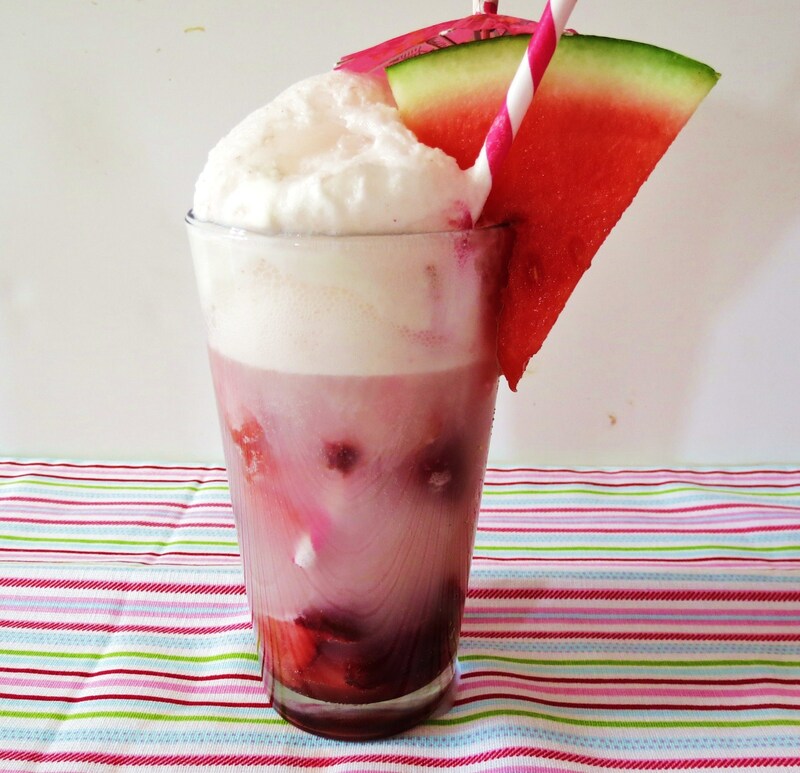 What a fun take on a normal rootbeer float! Such a great color. Have a great weekend! Wonderful recipe Jen! Can’t wait to try this out! My girls would go nuts for this! It’s a fun float! I like the fruit at the bottom. So it’s a float with a bonus at the end! 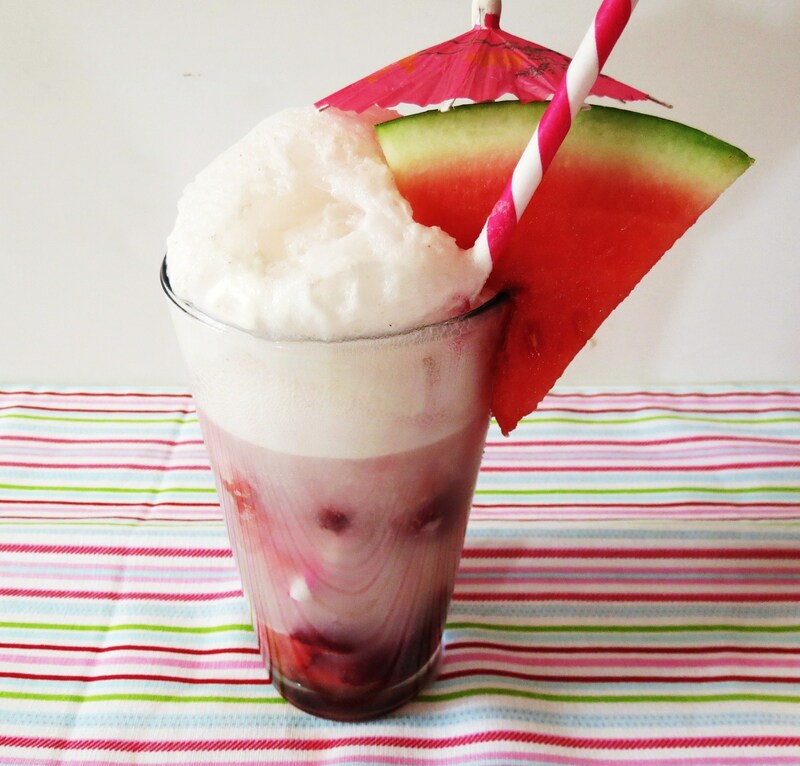 This float is so pretty, and is such a cool and refreshing summertime treat! I love it! I appreciated the side-by-side comparison–usually I would assume that sorbet is better but like you, I prefer less sugar. Also, I think fat is good for you if it is natural, whereas I don’t believe sugar is every good for you. So I’d definitely go for the natural ice cream over the sorbet! I used to buy sugar-free stuff but I really don’t like eating man-made chemicals, which is basically what Splenda and other aritificial sweeteners are, so I agree that the real natural ice cream is best. Aspartame gives me a headache and makes me feel awful. Splenda gives me no side effects but I just do not like the idea of eating something so fake. Have you heard of stevia? Now I’m a big fan of that substitute, b/c it’s natural, I just wish it was used more widely in products! I usually have to make my own treats with it (mostly in drinks). I love Stevia! I carry it in my purse, so when I go somewhere to get a cup of coffee, I just use my Stevia! The stuff is great! I also put it in my smoothies and other goodies. About a year ago I was all on board with Splenda, but kept getting stomachs, once I eliminated it, the stomach aches went away. Plus I heard when you have splenda it makes you crave more sugar because your not actually getting sugar. I like all natural and a little natural sugar in my opinion is better than fake man made kind. But Stevia is all natural, so I’m all for it!! By the way, I always thought sorbet was healthier to, I was shocked by the comparisons. I need to make homemade sorbet with Stevia! Once I get my ice cream maker, I’m going to give it a try! this looks good! i agree- real stuff > fake, no sugar added unpronounceable ingredients. stopping by from successful saturdays. this looks yummy and so pretty ! :) thanks for linking on successful Saturdays!